This spring the Italian brand brings us a great variety of models for all tastes. 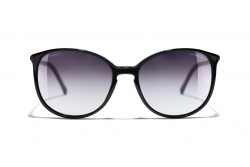 In this collection we can find light tones both in frames and lenses. Stylized forms and combination of materials are very present in this collection. For this spring, Chanel has launched two new collections in which the main protagonist is a chain that is completely integrated in the sunglass. Absolute Chain: The brand’s designers propose glasses with metallic frames whree the most outstanding element is the chaina round the frame. Some of these models would be CH4242, CH4244 or CH4245. Secret Chain: The other side of the collection is composed by models with acetate frames. 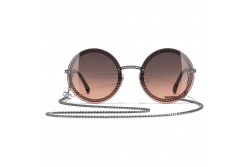 Squared or rounded shapes and even shield sunglasses. All of them have the characteristic chain but in this case it is not as visible as in the other collection. As an example we have CH4243 or CH5404Q. 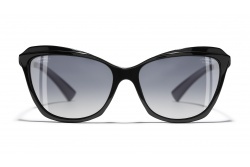 Models as Chanel 5368, 5369 and 5370 combine perfectly acetate and metal, giving as a result elegant and modern sunglasses. 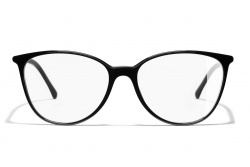 In this collection also stand out models as 4220 and 4221; they are rimless frames with metal bridge and temples. 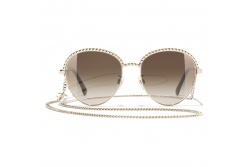 In this collection we can also find metallic frames, models as 4206 and 4207, combining aviator and round chanel sunglasses with mirrored lenses. 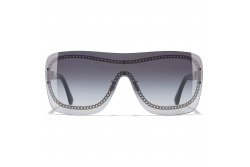 Furthermore, these models are available in many colours, making them an innovative and modern bet this spring. This collection offers models for all tastes and needs. A safe investment would be models 5279, 5315, 5313 and 5365. Basic colours and classic forms for these models that never go out of fashion.